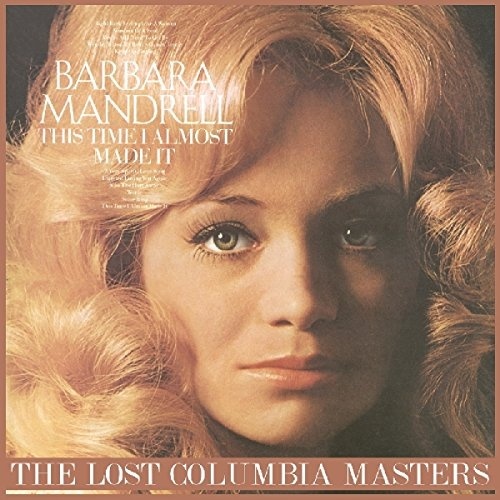 This Time I Almost Made It, the third album Barbara Mandrell released on Columbia Records, qualifies as "lost" because, unlike its two predecessors -- Treat Him Right and The Midnight Oil -- it never showed up on compact disc. This 2016 Real Gone collection marks the digital debut of the 1974 album and it's accompanied by nine bonus tracks, all Billy Sherrill productions recorded between 1970 and 1974, most unreleased until now. Although This Time I Almost Made It generated a genuine hit in its title track, the album does bear signs of both indifference and indirection. According to Joe Marchese's liner notes, Sherrill knocked out "This Time I Almost Made It" -- by far the best non-cover song on the record -- only when he realized they were running short of material, and his other original, "A Very Special Love Song," feels like a throwaway. Sometimes, it seems as if Sherrill isn't quite sure what to do with Mandrell. He keeps her away from anything that could be construed as a good fit for Tammy Wynette -- that divide becomes clear once The Lost Columbia Masters eases into the bonus tracks with "I Hope You Love Me," a George and Tammy number that's far harder than anything on the album -- and when the country does turn toward the straight-ahead, it's still soft; Merle Haggard's "Today I Started Loving You Again" doesn't carry resignation in Barbara's hands, only reassurance. Usually, Sherrill steers Mandrell toward pop, having her cover the Beatles ("Something") and Bee Gees ("Words"), but perhaps the most intriguing cover here is a slinky take on Marvin Gaye & Tammi Terrell's "You're All I Need to Get By," a country-soul hybrid that suits her well. It's a ringer, though: the rest of the record is country-pop with an emphasis on pop, a sound that's soothing but in this case a little transient. The bonus tracks find Mandrell on firmer country ground, singing Wynn Stewart and Harlan Howard's "You Took Him Off My Hands" and the Joe Maphis standard "Dim Lights, Thick Smoke (And Loud, Loud Music)," along with a bunch of other tunes that feel like they'd slide right into an AM country station in the early '70s. The worst is the military novelty "Coming Home Soldier" (co-written by Bobby Vinton) but the best of these are the skipping "Stay There 'Till I Get There" and the snappy "Son-of-a-Gun," which hints at the hits at ABC a few years later. Taken all together, this collection is imperfect but charming, thanks to the nascent talents of Mandrell and the period charms of Sherrill's production.